If you’re looking for a dip for your holiday party – here it is! 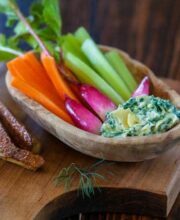 I was so incredibly surprised testing this recipe – the Garlicky Spinach Artichoke Dip was made with a base of silken tofu and light mayonnaise, cutting the amount of fat and calories. 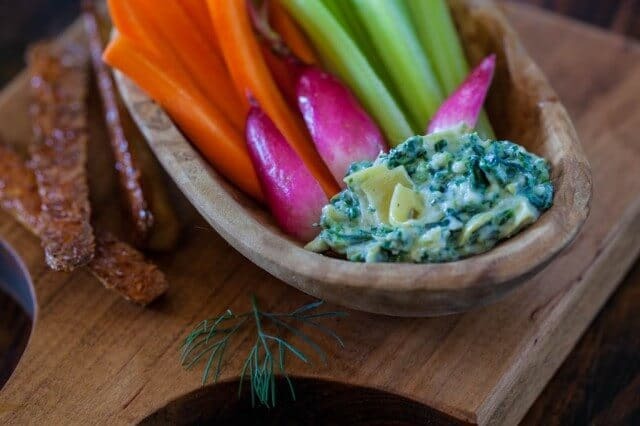 In return for opting for a healthier dip, you’ll be rewarded with a light, creamy, full-flavored dip that’s got a nice zing with the addition of garlic and lemon juice! For something a little different, we made baked tofu fries too. They take less than 20 minutes to make in the oven. Set your oven to broil, place rack near top (about 6" below heating element). Pat the tofu dry with a paper towel. Slice the block of tofu into 1/2-inch thick strips. Coat the baking sheet with the cooking oil spray. Add the tofu to the baking sheet. Coat the top of the tofu with more cooking oil spray. Broil tofu in the oven for 7-10 minutes, or until the bottoms are browned. Carefully flip and broil the other side for 7 minutes or until all sides are browned. Season while hot with salt and pepper if you'd like. 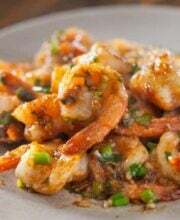 I also enjoy a little smoked paprika or a Cajun spice on them too. Drain the defrosted spinach and use your hands to squeeze as much water as possible out. Save the spinach water for another use if you want. In a food processor, add the mayonnaise, cheese, tofu, garlic, lemon juice, and salt. Blend until well combined. Add the spinach and dill and pulse a few times. Add the artichoke hearts and pulse 3-4 times until the artichokes are just coarsely chopped. 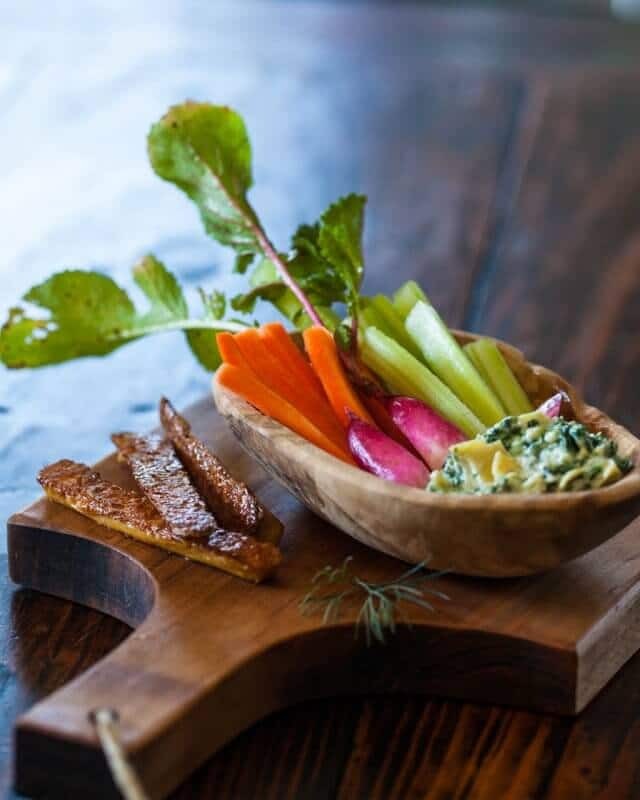 Serve as a dip with the tofu fries and other vegetables such as carrots, celery and radishes. I bought 12 boxes of firm Mori-Nu silken tofu from Costco. Yes it’s a lot but I love tofu and since it can be stored in the pantry I was hooked. It was my first time using the silken brand and I was quite surprised to find how different the texture is compared to other brands like Nasoy. But I’m happy to say I’m finding more and more ways to use it up. 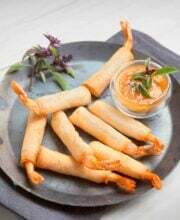 These tofu fries of yours are ridiculously easy and OMG so good 🙂 Just made them for my hubby and I for lunch along side some raw veggies and a yogurt dip. I seasoned ours with a little herbamare and some Jerk seasoning, so good 🙂 thank you Jaden! Love your blog I plan on linking it on my blog when I brag about your tofu fries. I am very excited to try tofu this way! I adore tofu. And spinach. And artichokes. And garlic! I am so excited to try this recipe. It sounds perfect for Christmas. Have you tried this dip hot? I am guessing it’d be delicious served hot with a Parmesan crust on top. There is no garlic listed in the recipe for the dip. What quantity is required? Thanks! 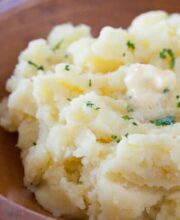 This looks like a great holiday alternative to heavy dips. And all those fresh veggies look so tasty! Hi, this sounds so yummy. Can you clarify one thing? I’m not seeing garlic listed in the ingredients but you state that the dip is garlicky. Was there an ingredient omitted? 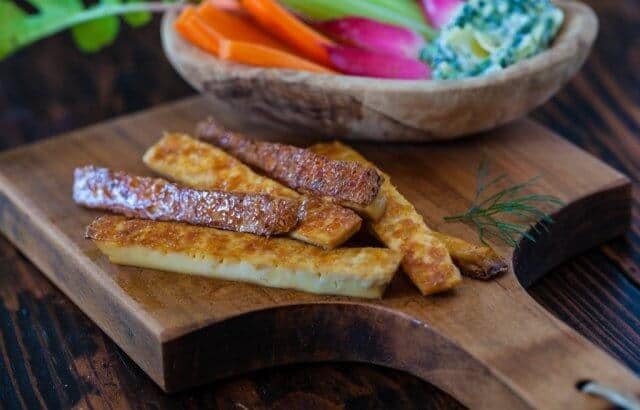 Baked tofu fries – that’s a creative one. It’s also one I’ll bookmark. Fantastic idea. Definitely fits my type of eating.